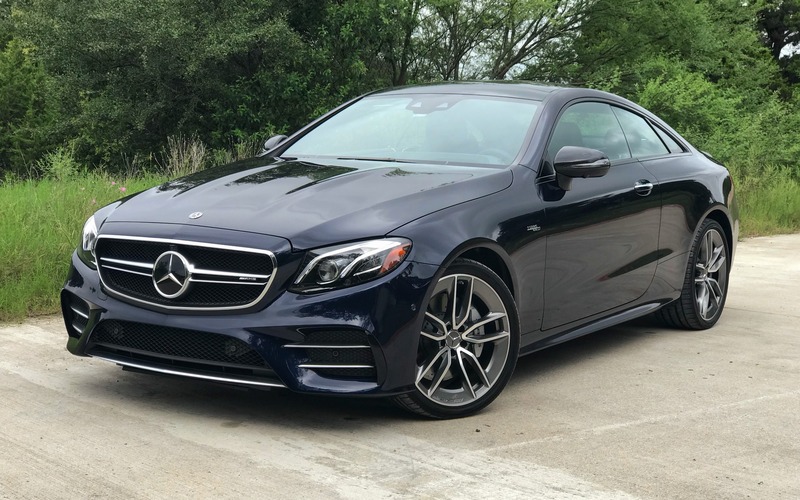 AUSTIN, Texas – I hate to break this to you, Mercedes-Benz, but your E-Class has often been dull—despite the fact that it boasts numerous great qualities recognized the world over. This critique doesn’t apply to the AMG versions, of course, nor to the discreet and nonetheless unbelievable E 63 S wagon with its 577-horsepower, twin-turbo V8 and all-wheel drive. In fact, your AMG performance division has worked wonders for the E-Class, like it did for the C-Class and pretty much everything it touches. This is something I’ve known for years and repeated ad nauseam. However, I must admit that I was more than pleasantly surprised by my first test drive of the new E 53 coupe, which took place in Texas. Why, you ask? First, there were the modern, flowing body lines and the nicely designed grille and alloy wheels on the midnight blue unit that I test drove. Next, there was the sleek and bright dashboard with its pair of wide digital screens, not to mention the comfortable and supportive designo leather seats and the usual quality of the materials and finish. AMG has dialled back the bling quite a bit these days, and it’s for the best. Want to know what’s most impressive about this new coupe? Actually driving it. As I approached the E 53 coupe, I would have sworn it was a C-Class—and I got that same impression once I took it out on the road. It offers equal parts agility and balance, comfort and solidity, silence and stability, which is really something. Its steering is direct and precise, and its pneumatic springs, in addition to maintaining a constant base, help raise the body to enter a sloping driveway or lower it four centimetres to load the trunk. As in the GT 53 4-Door Coupe, the drivetrain is simply exceptional. The 3.0-litre inline-six produces 429 horsepower and is fed by a turbo and a lag-eliminating electric compressor. It also gets an additional 21-horsepower boost from the starter-alternator, which activates quietly after each stop. Rounding out the offer are an impeccable nine-speed automatic gearbox and the AMG all-wheel drive system with full-time torque transfer. Need I say more? No one delights in the most powerful and dynamic AMG versions more than me. One of the privileges of this job is being able drive them and push them to the limit on a track. However, if I had to drive one on a daily basis, all year long and on roads riddled with potholes (as is the case where I live), I would take a good hard look at the E 53 coupe and its cousin, the four-door GT 53. Like the E 53 cabriolet, these two offer a delightful combination of elegance, comfort, refinement and performance with an always sharp, controlled ride that is never robotic or soulless despite their wide range of electronic systems. And that’s no small achievement! The head of AMG, Tobias Moers, has just gained direct access to the big boss of Mercedes-Benz, in recognition of the importance and growing success of this division for the granddaddy of manufacturers. And that’s a wise and welcome decision for all car lovers.